HomePunky HomesteadKitchen of ChaosPunky Approved RecipesCookin’ Time! 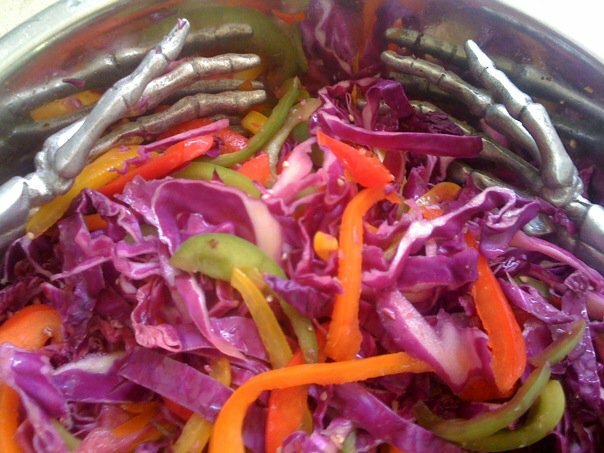 Punkymom’s Fertility Slaw! I cannot believe this wasn’t our first Cookin’ Time! recipe! What was I thinking? I can’t even tell you. Our own Winter Rosebudd shared this deliciousness with us oh, five or so years ago! Punky Mom’s very own fertility slaw! Now, I make a lot of slaw. Mayo slaw, vinegar slaw, non-mayo slaw, I’ve got about six “standby” recipes for slaw. Cabbage is cheap, filling, crunchy, mild and delicious. Did I mention cheap? An uncut cabbage keeps practically forever in the fridge (unwrapped! no plastic! ), so if you forget about it in the back, well, it’ll still be there in a week or two when you find it again! Purple cabbage? Full of good stuff and flavour. Green cabbage? A delicious mild, peppery kind of taste. Well, enough about my love of cabbage, onto Ms. Rosebudd’s slaw. This is my own recipe...its really pretty, with lots of bright colors... Its fat free, totally yummy and for some odd reason, gets people pregnant...just ask your fellow Punkymom's!!! Whisk dressing in a bowl. Mix with other ingredients and refrigerate for 1 hour at least. You can easily sub this dressing with any Asian style dressing. I like mine because its fat free and I think it tastes better without the oil!